What if instead of relying on the current loony scape of programmatic media-buying, big advertisers built their own plumbing from scratch, cutting out the multitude of ad tech middlemen? That’s exactly what some big advertisers have begun doing as part of a unique beta project to develop a pipeline that connects directly with their supply chain of publishers, cutting out intermediaries, and with it, the so-called “death by a thousand cuts” that eats up the majority of their working media budget. The project being managed by serial entrepreneur Charles Cantu and his latest startup, Reset Digital, is more than just a bypass model. It’s an attempt to gain control of a process that most big marketers believe has gone out of control. Aside from the economic inefficiency of paying third-parties to process what should be a far more direct exchange, the goal is to give marketers more transparency in the process, enabling them to have visibility into the explicit log files, which contain all the meta data on a programmatic media buy from end-to-end. As part of a series of conversations with Cantu, I asked him to share some log files with me so I could try and explain it to readers. When Cantu passed a sample along, I was sorry I asked, because they are far too granular for all but the geekiest to eyeball and make sense of (see screenshot below). The good thing, says Cantu, is that people don’t need to look at them when they have machines built to process -- and optimize -- them. The machine’s algorithms, for example, can be tweaked to filter out logs that smell funny or detect patterns of unsavory traffic, or explicit faud. Unlike other third party platforms -- the food chain of DSPs, DMPs, SSPs, etc. -- Reset Digital isn’t creating those algos to optimize its outcome and insinuate itself into the waterfall. 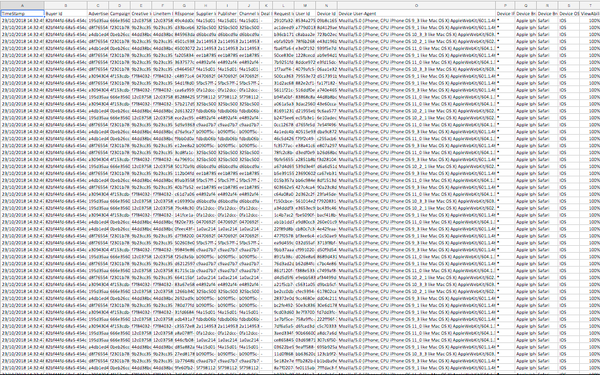 It’s building the pipes and processing the log files to ensure they work the way a marketer intended them, end-to-end. Ultimately, Cantu says it will be up to marketers and whatever other parties they assign to review that process, including internal or external auditors. Reset’s job is to build the plumbing necessary for them to do that. Toward that end, Cantu has been working behind-the-scenes with some top marketers currently developing standards for defining digital inputs and outputs to ensure they fulfill not just marketing objectives, but their companies’ overall enterprise objectives. Much of that work has been conducted by MASB, the Marketing Accountability Standards Board, which will meet at an event hosted by Forbes in New York on Thursday to help propel the initiative to its next phase. Cantu, meanwhile, has already begun beta testing Reset’s direct pipeline with some big marketers, which he says he cannot disclose for confidentiality reasons, but he did share that one of the is a television network that uses programmatic for its tune-in advertising. The results of the beta, he says, will help Reset tweak its technology to continually optimize marketers’ outcomes based on their specifications. Because Reset uses a software-as-a-service (SaaS) model, the cost of its technology scales based on the volume a marketer uses it for, and he says initial results from the beta have already demonstrated some considerable efficiencies by weeding out other intermediaries. “We’ve already seen improvements of 26% to 36% over what everybody else is doing, just by cleaning out the ad tax,” he says, noting, that Reset’s longer term roadmap will enable marketers to optimize against other outcomes, including actual sales data. 4 comments about "What If Marketers Cut Out A Thousand Cuts?". Ed Papazian from Media Dynamics Inc, December 3, 2018 at 10:21 a.m. Interesting, Joe. I have wondered why advertisers in conjunction with savvy media buying services don't create their own "unwired" digital media networks and deal directly with them so their ads are embedded in content---hence visible---and they know exactly what they are getting for their money while paying the website "partners" a fair price for their ad exposure. Andrew Susman from Emoto, December 3, 2018 at 10:28 a.m.
Henry Blaufox from Dragon360 replied, December 3, 2018 at 1:53 p.m.
Ed, when joint efforts on buy side, sell side or both have been tried in the past, they've withered. This goes back to print and broadcast media. Over the time it's taken to build these out, stakeholders can't seem to agree on functional specs, standards, data definitions - you name it. They often won't agree to put any person or entity in charge of the undertaking, or give effective management authority and budget. The efforts wither over time. Remember AdsML? Ed Papazian from Media Dynamics Inc, December 3, 2018 at 3:12 p.m.
Henry, I can't speak for this particular venture however, I'm wondering why an independent outfit representing various clients but with a single entity in charge can't cobble together a deal direct network with regular "affiliates" composed of cooperating websites and skip the "tech tax" as well as other issues---like low ad viewability, placements next to offensive content, fraud, etc. It would be something like an "unwired" TV network where which deals with the local stations and buys time on a national basis with full and proper accounting, ratings. audience guarantees, targeting, etc.